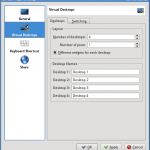 VNC is a remote desktop sharing protocol that can be used to control the desktop of a remote system over the local network of internet. To setup desktop sharing with vnc, a vnc server has to be installed on the remote desktop that shall be controlled. And a vnc client is needed on the local system that shall be controlling the remote system. For example you might be at your office and want to control your home pc. Or you want to provide remote assistance to your client on his desktop. Remote desktop is widely used for a variety of needs. On linux there are plenty of vnc service/client applications available for both gnome and kde. Lets see how to setup vnc based remote desktop on kde. Setting up remote desktop sharing on KDE desktop is quite easy. First install the krfb and krdc packages. 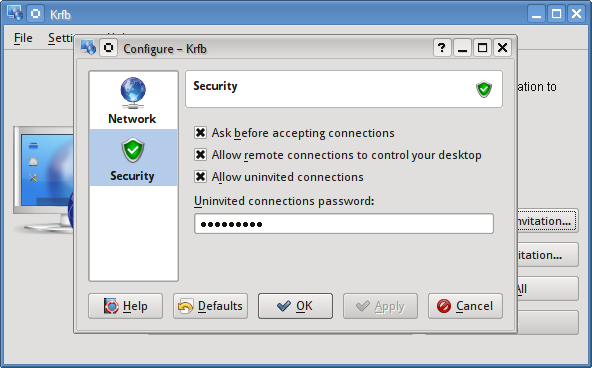 Krfb is the server application that will open a vnc server to enable any vnc client to access your current kde desktop. Krdc is a vnc client for kde. If you want to connect from some other system like a windows or mac then you can use any vnc client on that particular system. So the first thing to do is to start the vnc server on your kde desktop. 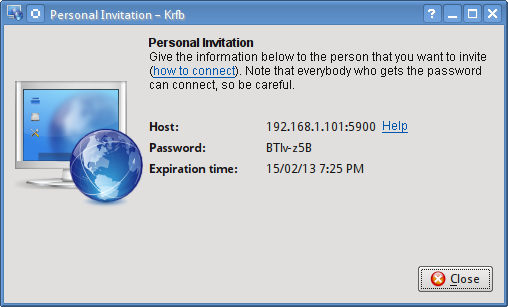 A good thing about krfb is that it allows to create discrete invitations and manage them. Each invitation has its own password and an expiration time of 1 hour. Apart from invited connections, it also allows uninvited connections which have a common password and do not expire. The invitation details contain the ip, port and password to be used by the vnc client on the other end. This is quite easy. For uninvited connections setup a strong password in the Settings > Configure Desktop Sharing window. 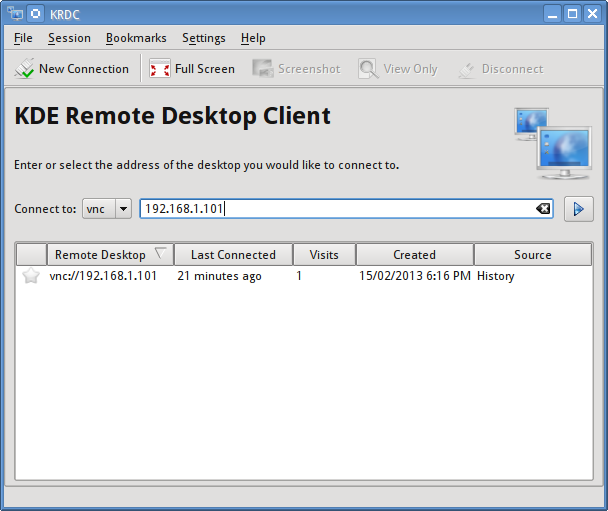 In this example we are using the krdc vnc client on kde itself. Launch krdc and enter the ip and port in the connection text input. After connecting it shall ask for the optimal connection speed and the password. Then it should display the remote desktop. Keep note that if the vnc server is behind a LAN or router then port forwarding has to be setup for the client to be able to connect. Why use VNC when you can directly access computers remotely using tools like logmein, R-HUB remote support servers etc?